The modern style steam pod is an enclosed walk in unit also containing a shower. It has a seat inside it and like a modern day steam room you are completely enclosed inside it. Two people can fit inside this at one time if you are having a shared or double bath experience. 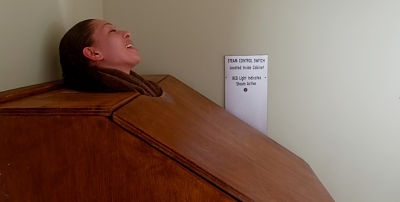 The Victorian style steam pod is a wooden box which you sit inside with your head exposed out the top. It is a gentle steam which allows you to breath in the air of the room. Only one person can use the pod at a time. Customers often ask us what is the best steam pod option. The answer really is down to your personal taste. Both steam pods will open your pores and maximise the benefits of the bathing experience.